Issue 17 – HackSpace magazine LumiDrive LED Driver … Python control for LEDs, CircuitPython powered! @HackSpaceMag @Sparkfun « Adafruit Industries – Makers, hackers, artists, designers and engineers! 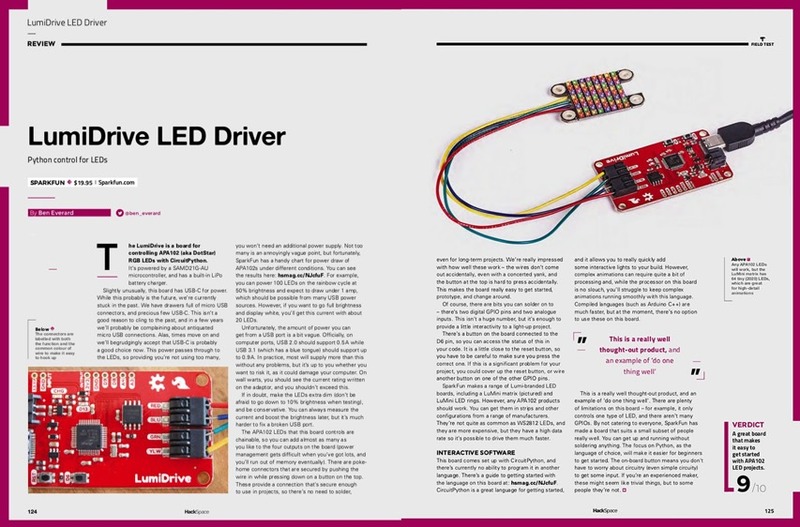 Issue 17 — HackSpace magazine has a review of the SparkFun LumiDrive LED Driver … Python control for LEDs and it gets high marks, 9 out of 10! The LumiDrive is a board for controlling APA102 (aka DotStar) RGB LEDs with CircuitPython. It’s powered by a SAMD21G-AU microcontroller, and has a built-in LiPo battery charger. This board comes set up with CircuitPython, and there’s currently no ability to program it in another language. There’s a guide to getting started with the language on this board at: hsmag.cc/NJcfuF. CircuitPython is a great language for getting started, and it allows you to really quickly add some interactive lights to your build. Read more (PDF, pages 124 and 125). We’re really excited to see many companies, like Sparkfun, individuals, and communities, using CircuitPython for their products and projects. From space exploration, to assistive technology, CircuitPython is helping getting started fast with electronics … using Python! 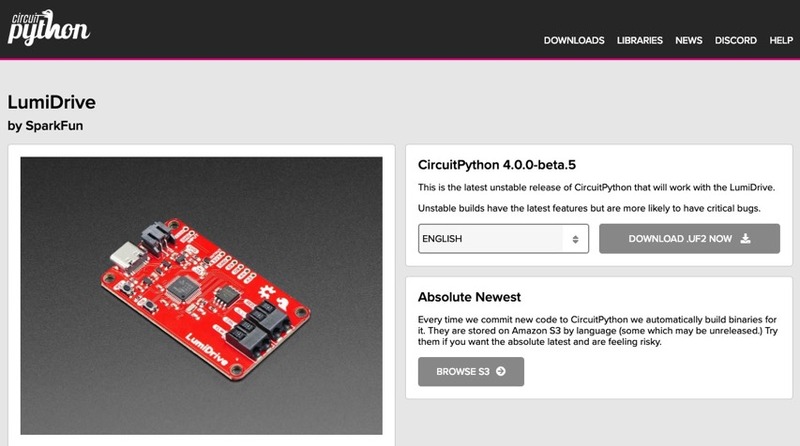 For an ongoing and updated list of all the boards that support CircuitPython, visit the stand-alone site for the CircuitPython community at https://circuitpython.org/ and check out the downloads section. We’re looking for help keeping the site updated, please feel free to do add edits as pull requests and/or open issues on GitHub! More CircuitPython with the SparkFun LumiDrive. CircuitPython snakes its way to the SparkFun LumiDrive LED Driver. Make a LED light ring for macro photography with CircuitPython.